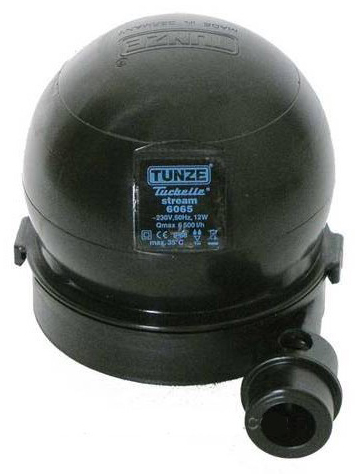 Return or recirculation pumps have long been a part of the Tunze product offering. This past year Tunze has added a couple of new models. This article will introduce the new pumps and also offer some general advice on Tunze product applications. Tunze offers 3 lines of recirculation pumps known as the e-Jet, Comline and Silence pumps. Flow rates range from a nominal 65 gph for small reactors up to 2900 gph for closed loops and large systems. Two of these models are DC controllable pumps. Tunze’s earliest line of pumps is the e-Jet series. These pumps are multipurpose and may be used as conventional powerheads, in-sump return pumps, or as quick polishing filters. Most notable for use as return pumps are models 1205 and 5005. 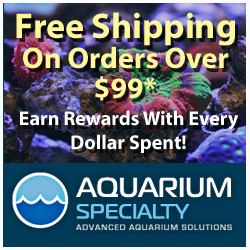 These pumps come complete with a magnet mount and quick polishing filter cartridges. The Tunze 1205 e-Jet uses 22 watts of power with a maximum capability of up to 114” of head pressure at which point the flow would equal 0 gph. At zero inches of head pressure the flow is 320 gph. In practical terms at the typical 36-48” of head pressure the Tunze 1205 e-Jet delivers a flow rate ranging from 150-200 gph. The 1205 features two impellers. There is a smaller impeller for situations where an even lower flow level might be desired. This smaller impeller maxes out at 225 gph. The compact size and simple design, coupled with its energy efficiency and low heat output, make it an ideal pump for smaller tanks, including European tanks with metric plumbing. An important consideration regarding the e-Jet pumps is that the outlets are metric with adapters for 11, 17 and 25 mm pipes and hoses. The Tunze 5005 e-Jet is a DC model which consumes 40 watts of power and includes a flow control adjustment. This pump comes standard with a 25 mm outlet and can deliver up to 1100 gph at 0 feet of head pressure. Its maximum capacity is reached at 90” of head pressure where a 0 gph flow rate is realized. With the average 36-48” of head pressure the user should experience a flow rate in the range of 350-400 gph. Replacing the impeller housing and impeller with compatible ones from the Tunze 1205 e-Jet (parts 1201.130, 1200.150 and 1205.700) will allow for higher pressure applications and will yield a maximum head pressure of 216.5” with a maximum flow rate of 370 gph. The flow curve for this pump is very flat. Extending up to 60” of head pressure still realizes a flow rate 300 gph. This pump is ideal for higher head pressure and lower flow applications. Tunze’s most recognized recirculation pumps are the Silence series pumps. They have added a new model for 2016 bringing the total to 6 models in this series. The Since pumps are the most versatile recirculation pumps for use as returns or in tandem with reactors. The Silence pumps use standard pipe thread and are equipped with hose adapters. They may be used in both external and internal applications. These pumps include suction cups and are designed to simply sit on the floor of a sump or stand. 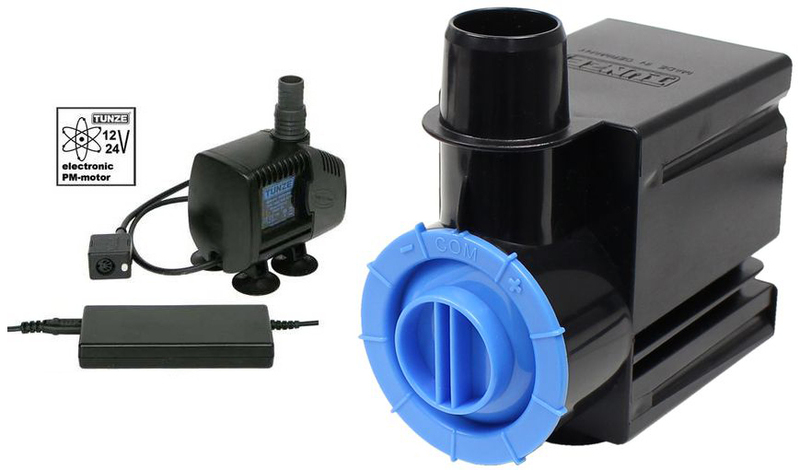 Silence series Model 1073.040 is an ideal return pump for tanks under 120 gallons. Like the 1073.040 it utilizes ¾” NPT fittings. This model is capable of handling head pressure of up to 118”. The flow rate is mechanically adjustable from 80-790 gph. Power consumption ranges from 16-42 watts. Operating at the typical 36-48” of head pressure, the flow rate will be in the range of 400-500 gph. For higher flow applications you can use two pumps independently or in tandem with one another. This will result in a significant boost in head pressure allowing the flow rate to nearly double under the same head pressure. Silence series model Electronic 1073.050 is the DC version of the 1073.040. The DC version realizes a higher maximum head pressure of 153.5”. This correlates to a marginally higher flow rate of 500-600 gph at the standard 36-48” head pressure operating level. The flow on this model is controlled electronically and can range from 290-790 gph at zero head. Power consumption ranges from 10-43 watts and it is 24V DC. This DC pump can be augmented with the Tunze Safety Connector 6105.500 (battery backup) for use during power outages. It also can be used to create unique tidal surge effects when used with a controller. A tide pool tank could be set to have a very low flow rate for some hours and then have the flow increased to “fill” the tank. Model 1073.060 is the newest addition to the Silence series pumps. This pump utilizes a 1” NPT inlet and outlet while delivering a mechanically adjustable 660-1320 gph. The 1073.060It ships with suction cup mounts and hose barbs. The power consumption is 38-85W and the maximum head pressure is 146”. With the 1073.060 at our typical 36-48” return height, the flow will be in the range of 800-900 gph. This pump would be ideal for tanks in the 150-250 gallon range. The footprint is 6.8” by 4.4” by 3.4”. Silence Pro 1073.110 is a strong return pump for larger systems. Uitilizing 1.5” NPT connections and equipped with hose barbs and silicon feet, this pump may used internally but is equipped for external inline use out of the box. If operating the pump internally, it is suggested that you utilize the optional suction housing 1073.114 in order to prevent debris from damaging the impeller. This pump uses a specially designed turbine impeller with a very large, rare-earth magnet rotor to generate extra flow at higher head pressures. Power consumption is greater at 95-125 watts. The maximum flow rate is 2900 gph and maximum head pressure is 183”. With a flow rate near 2000 gph at a head height of 48″, this pump is well suited for tanks of 500 gallons and larger. Users should bear in mind that it requires three 1” pipes to equal the flow rate of a single 1.5” pipe. Ideally, this pump should be plumbed with 1.5” pipe for the complete distance, though an adapter to multiple smaller lines of equal flow capacity would be allowable when supplying multiple devices or systems. Although this article provides a comprehensive overview of all of the return/recirculation pumps offered by Tunze at this time, it may not include every detail you may need to know for your specific application. Feel free to visit Tunze.com where you can download any manuals and get more detailed info for any model which piques your interest. All of us at Tunze appreciate your interest and support of our products!